As I type this, which has no connection to when it will flash across the interweb as a published post, I am a few short days away from embarking on a week’s vacation away from computers, blog, interwebs, and tweets. My brain seems to already be in vacation mode, leaving me searching for something interesting to say about glazed carrots. Frankly, I’ve got nothing. Not even a picture to tempt you with their glazed deliciousness. All I can say is that in less time than it will take us to pack up our car for the trip, you can be serving up some glazed carrots. Now that I think about it, these would make a great side to pack for our road picnic. Great; now in addition to packing, cleaning the house, and finding a swim suit that I will not be embarrassed to wear in public, I need to make a batch of glazed carrots to save me from the temptation of rest stop french fries. Why didn’t t anyone ever tell me how much work it is to go on vacation? BAH Note: This recipe is quite versatile and adaptable to whatever flavor combinations you prefer. Prefer savory over sweet? Substitute balsamic or soy for the orange juice. Or get edgy and use ginger beer for a sweet and spiced flavor. 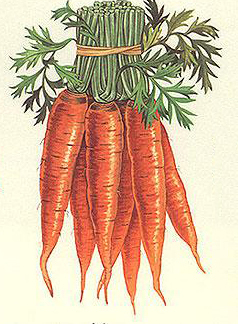 You “could” use whole carrots that you have peeled and cut into rounds or sticks. I choose to use baby carrots straight from the bag. Mr. Bittman says to use a saucepan 6 inches or less across. I used a 2 quart saucepan just fine and suspect that I would have even been ok using my 10 inch frying pan. Combine all the ingredients in a small saucepan. Bring to a boil, cover and reduce heat to a simmer. Cook for 20 minutes, or until carrots are tender. Remove the lid and cook the remaining liquid down until it is nearly evaporated. Serve the carrots with a bit of glaze. So I have to say–I’ve also had the “finding a swim suit that I will not be embarrassed to wear in public” dilemma (on and off ever since I became self-aware at the age of 12). And the solution to my problem was Land’s End! I love their bathing suits. You can find suits to fit your body shape, your level of modesty, and they’re super well made. A friend recently served carrots glazed with jellied cranberry sauce. Sounded weird, tasted good. I can see the cranberry sauce melting down into a glaze with the help of some liquid or a bit of butter.� And I don’t think it sounds weird at all.